Stitch Therapy: Marilinda halfway there! 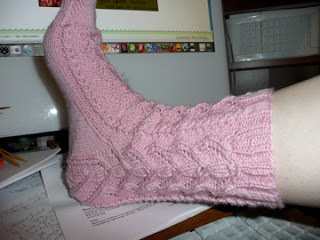 That's right, today I finished the first Marilinda sock. After I got past the leg and heel, it went pretty fast I think. It fits well and I really really love this sock. Out of alllll the Cookie A. patterns, this one is my favorite. Twisted Flower was, until I started this one. It's just gorgeous I think. I got a few things in the mail since the last post. 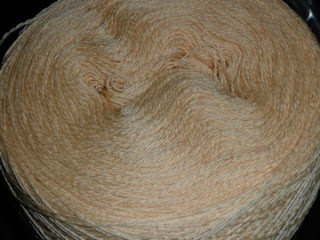 My lace came from Sarah's Yarns and I've already ordered 3 more colors. I wasn't sure if I'd like the plain merino or not but I do so I got the colors I wanted originally. 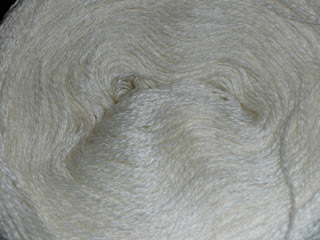 Here is some white zephyr wool silk. 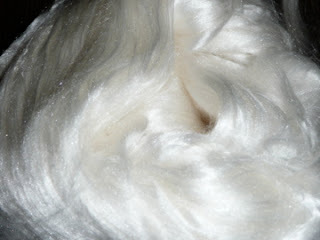 I will use this either for a Wing o the Moth shawl or the Lily of the Valley. I have some Pewter coming which is a silvery color that might be better for the moth shawl, so I won't decide till it gets here. No hurry anyway. 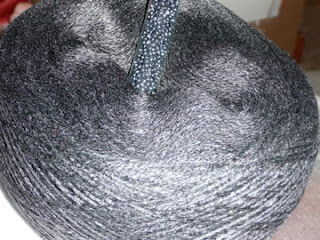 Ebony wool silk, posing with some beads Melissa sent me ages ago. This is for the Honeybee stole, I'm still debating the beads. This is the shawl I will start first, since I want a black stole for my anniversary in May. I plan to go somewhere nice to eat. Unlike last year which got screwed up and we could only find ONE decent place open to eat at 10 pm. I can't remember what happened...but I didn't get to dress up. I've got two more colors of this stuff coming in the colors Peacock and Mulberry. The peacock is for the Pretty as a Peacock shawl, which I could resist no longer, and the Mulberry for a circular shawl called Gretchen that I found the pattern for on etsy. 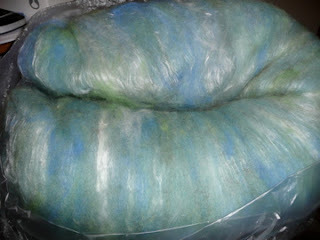 I also got a pound of rambouillet roving, but it's not much to look at so I won't show it. 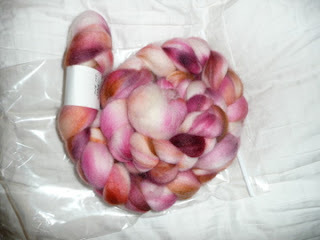 I added it to my ever growing pile of wool to dye. 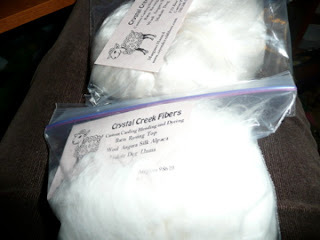 I also got two baggies of sample fiber from them. One I have NO idea what it is. It's either angora or doggy. It's just kinda hard to tell since it's white and super soft. It has dog listed on that card in the baggy along with the other stuff they carry so I'm not just crazy. AND I got this gorgeous silk. I KNOW what that is. It's soooo freaking soft and gorgeous. I just keep opening the bag to pet it. Anyway I'll be back later. 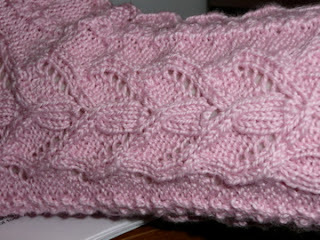 I'm off to try and get to the border on my spring things knitter shawl so I can finish it already. Marlinda is so pretty! I love that sock. I love both the Honeybee and the Bee Fields. I've already knit the Bee Fields and now I'm seriously thinking of doing the Honeybee in brown or black. I can't decide. Wow you got the motherload of fiber! -=giggle=- The socks look beautiful dear!! I'm 23, married, and have two kids! Knitting is my passion, and I'm also loving dyeing, spinning, and learning to sew! Just a bit of an update.